The Assembly does not have a procedure to unseat the president. 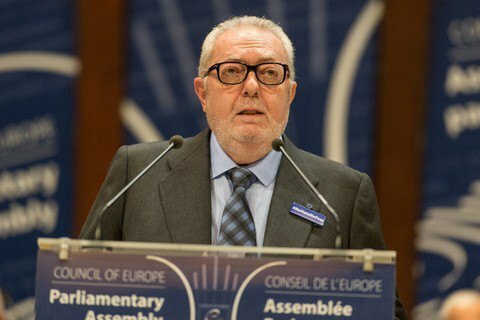 The Bureau of the Parliamentary Assembly of the Council of Europe (PACE) passes no-confidence motion to PACE President Pedro Agramunt and forbade him to take any action on behalf of the Assembly. "PACE President Agramunt did not write a letter of resignation, did show up in the Bureau and, accordingly, did not make any statement, despite earlier promises. The Bureau of the Assembly has just passed by a landslide majority a no-confidence motion and refused to allow him to make any visits, statements or any other activities on behalf of PACE," Verkhovna Rada deputy, chairman of the Ukrainian delegation to PACE Volodymyr Aryev wrote on his Facebook page on 27 April. The Ukrainian lawmaker also noted that the PACE does not have a procedure for recalling the president from office for absence of a precedent. The Assembly regulatory committee should develop this procedure, Aryev said. The PACE delegations of Ukraine, Denmark and Poland have called on the PACE to denounce the visit of Agramunt to Syria with the Russian delegation in March. The delegations of Lithuania, Germany of Austria have later joined the statement. Agramunt, in turn, said he visited Syria in March with the Russian delegation as a Spanish senator. In case Agramunt resigns, he is to be replaced by PACE Vice-President, Ukrainian delegate Heorhiy Lohvinskyy.